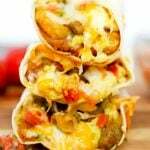 Your family is going to love these Freezer Breakfast Burritos! They are so easy to make, totally customizable, and are the perfect way to start your day! Let me tell you a little secret — I don’t know any mom, wife, grandma, or super hero on this planet that has time to make a sustainable, nutritious breakfast for their families every single day. None. Zero. I can’t tell you how happy I was when I discovered the concept of food that you can prepare ahead. 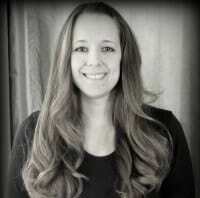 Freezer meals — microwave food that you can MAKE YOURSELF. Food that, in theory and ingredients, is healthier and more delicious than the breakfast foods that you buy in the freezer section. This is a real thing, y’all! And I’m back with a KILLER recipe that proves it! Imagine yourself popping one or two of these in the microwave for your hubby while he’s getting ready for work, saving him from the drive thru. Or warming one up for your child so that you actually have time to brush through your hair, knowing that your days of showing up bra-less to the drop off lane at school are over! These burritos are delicious and you can add so many things to them to pump up the flavor! 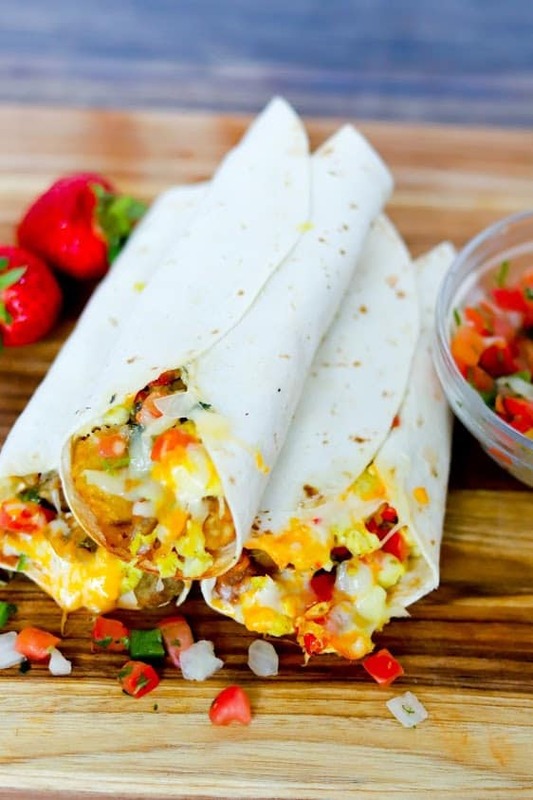 I promise that these Freezer Breakfast Burritos will be a staple in your weekly meal prep! Breakfast really is the most important meal of the day — it’s been scientifically proven. I ALWAYS feel so much better when I’ve eaten in the morning, and my coffee sits better with me if I make it a priority to eat something. I know the saying is “Eat breakfast like a King, lunch like a Prince….” etc. But we don’t all have the motivation to wake up at five in the morning to make and eat a whole buffet of food. When was the last time you made it to your lunch break without feeling like you could eat an entire cow by yourself? Can’t remember? Then you need this recipe in your life! Obviously you can’t have a burrito without a tortilla. You can use flour or wheat tortillas, depending on how healthy you’re trying to be! 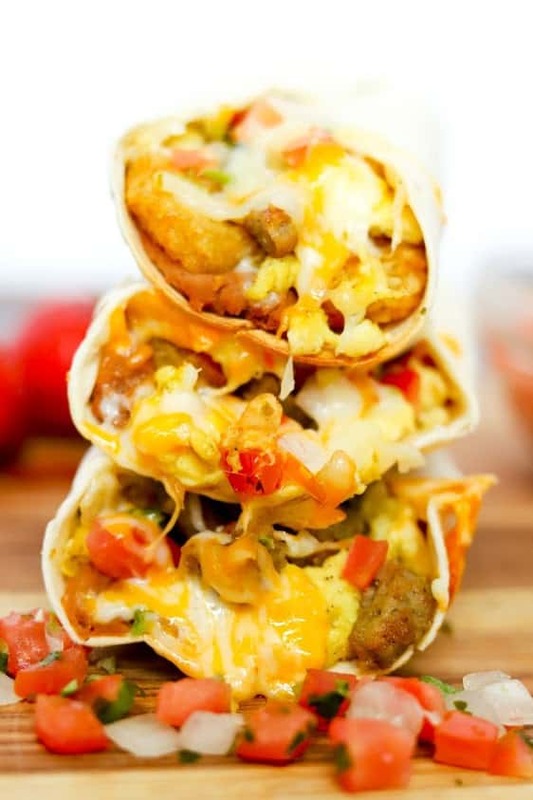 You’ll need fillings: Eggs, tater tots, cheese, pico de gallo, refried beans and breakfast sausage. Don’t forget to use ingredients that enhance the flavor! I use heavy whipping cream, cilantro, salt and pepper. 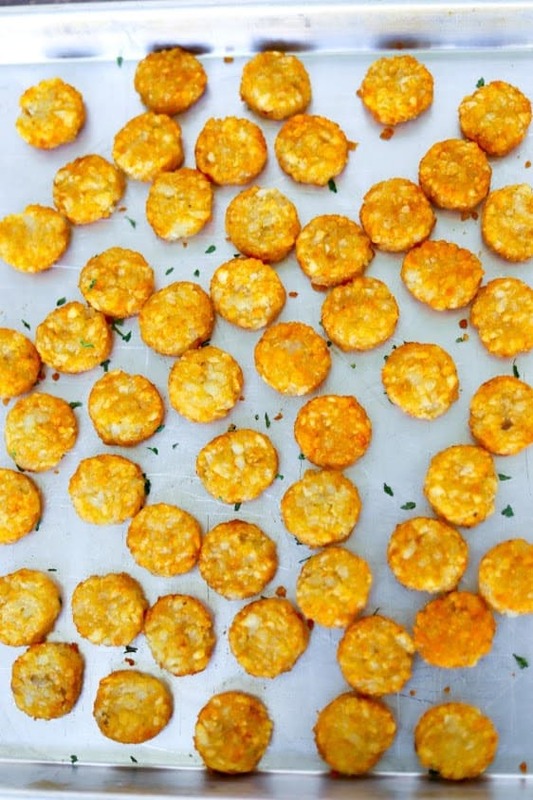 Start by cooking anything raw or frozen like eggs, sausage and tater tot rounds. 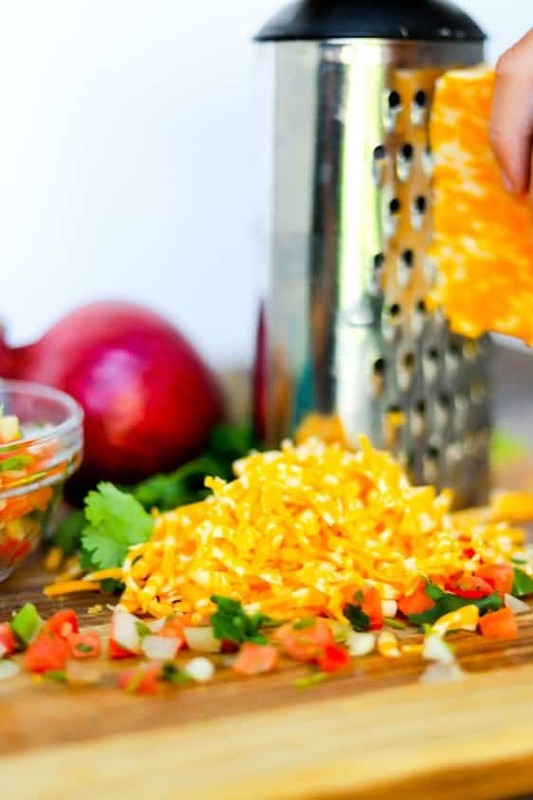 Add these, along with your beans, cheese and pico de gallo to your tortilla and roll it up burrito style! Place them on a baking sheet, seam down and bake at 400° for 13-15 minutes. Wrap the burritos tightly in plastic wrap or place them in freezer storage bags and keep in the freezer for up to one month. Eggs: These are the base of every note worthy breakfast burrito. Salsa: I love eating my breakfast burritos with salsa! Sour Cream: Obviously, this is to go with the salsa. It’s like peanut butter and jelly… can you really have one without the other? Bacon: If you’re sick of the same old breakfast burritos try making them with bacon. Everyone loves a bacon, egg, and cheese breakfast item! Sausage: This is a super predictable add-in, but I have no shame. Sausage lovers will agree, this is a necessity! Syrup: Now, hear me out. If McDonald’s can make a bacon, egg, and cheese McGriddle… why can’t my 4 year old dip her bacon, egg, and cheese burrito into some syrup? Cheese: Gooey, melty goodness. Inside the burrito, outside the burrito, just do it! 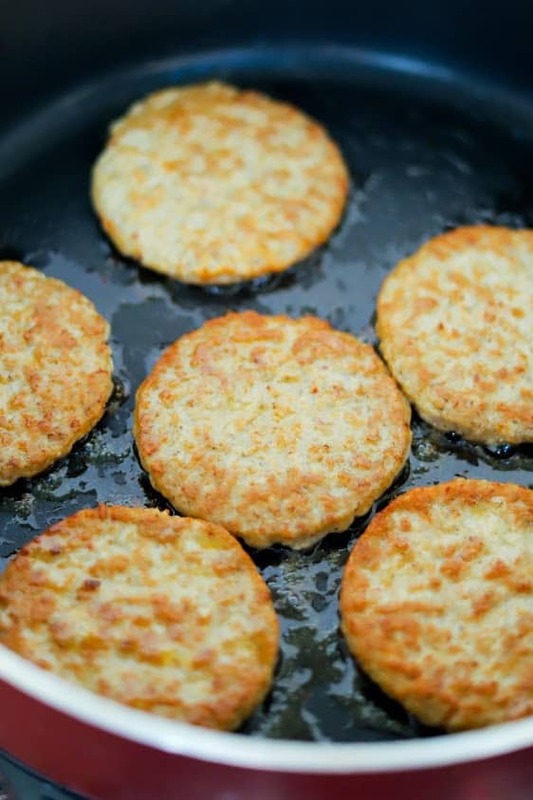 Potatoes: Hash-browns, tater tots, or diced potatoes. Potatoes add a bit of salty flavor and they’re filling, too. Pico de Gallo: Pico gives these burritos an extra kick of flavor! I seriously can’t believe I went for so long without thinking to prepare breakfast ahead of time! The best part about this recipe is that you could make a month’s worth of burritos if you wanted. You’d have an easy breakfast for every day of the week! These Freezer Breakfast Burritos have changed my life for the better, and I promise that you’ll feel the same way! You really should try these burritos today! You don’t even have to make extra and freeze them, but I would highly suggest it! 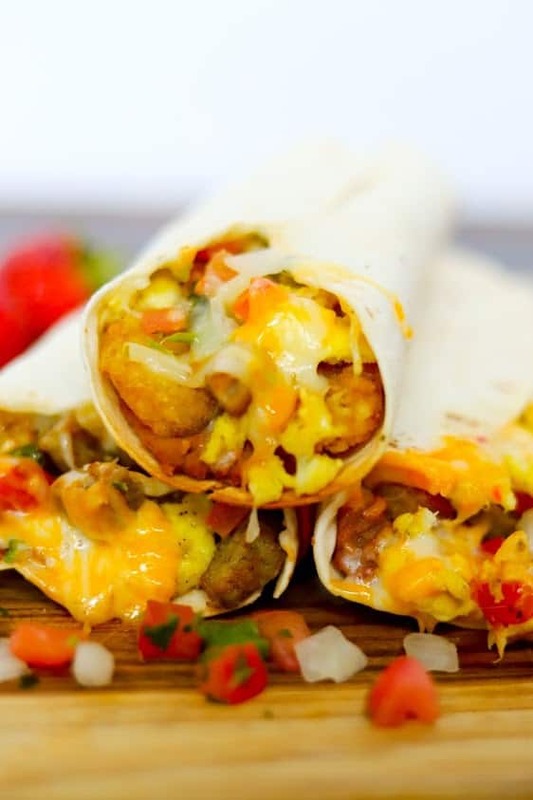 Your family is going to love these freezer-friendly breakfast burritos! They are so easy to make, are customizable, and are the perfect way to start your day! Heat Butter in a Skillet over medium heat. Add Round Breakfast Sausages and cook until browned on both sides, about 3-5 minutes per side. Remove from the skillet and do a rough chop on the sausages. Turn the skillet down to medium-low and add your lightly beaten eggs. When the eggs are just starting to set add your Heavy Cream, Salt and Pepper - continue to cook until thickened and the eggs are done. 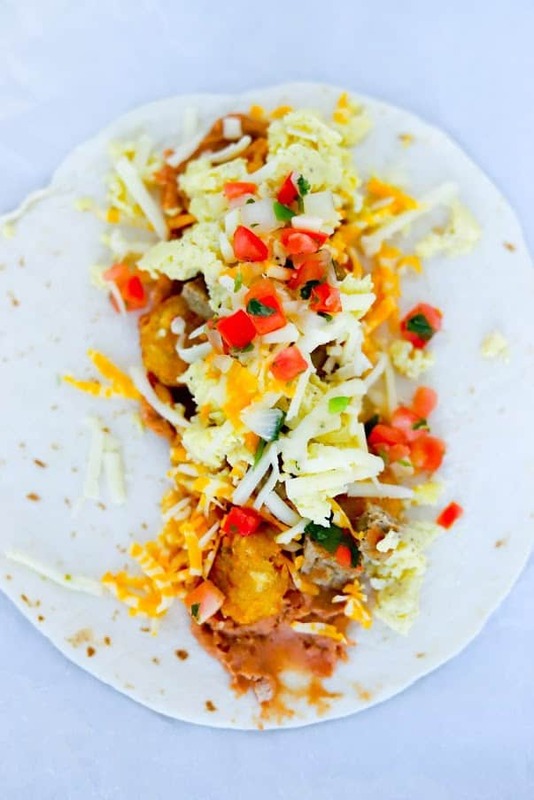 On your tortillas - add beans down the center of tortillas topping with tater tot rounds, sausage, eggs, cheeses, pico de gallo and cilantro. Fold in opposite sides of each tortilla and roll up burrito-style. 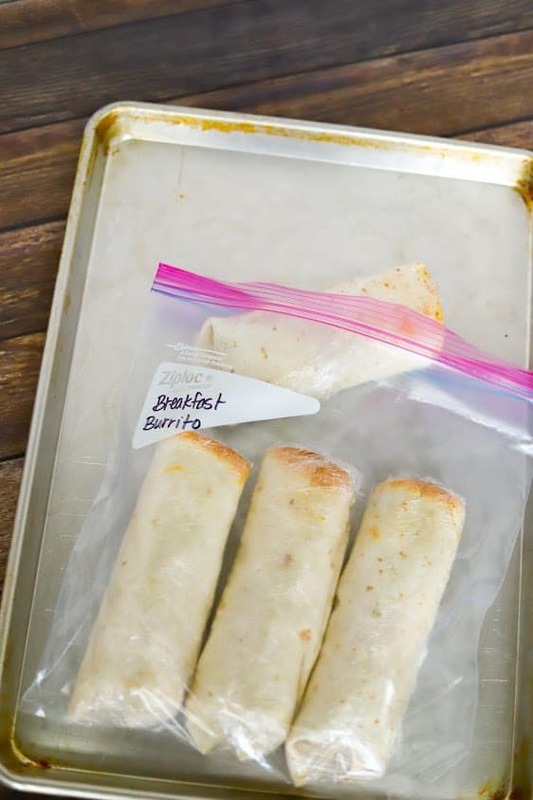 Place each burrito seam-sides down onto a preparing baking sheet. Place in the oven and bake at 400° until heated through, about 13-15 minutes. Serve and enjoy! FREEZER DIRECTIONS: Cover each burrito tightly with plastic wrap. To reheat, (1) microwave for 4-6 minutes, making sure to turn halfway through cook time, or (2) bake at 400 degrees F for 30-40 minutes, or until completely cooked through and cheese is melted. These will keep in the freezer for up to 1 month.